It was Friday afternoon, on a turbulent 45-minute bus ride from Derby to Nottingham…whilst my friend complained about motion sickness from the perilous swerves, I exclaimed with unintended passion “now imagine the neonates!” That awkward split-second was when it dawned upon me: my BMedSci* Honours Year research project, in Academic Child Health in the School of Medicine, had slipped its way into my daily life. My project evaluated the effects of neonatal ambulance transfer on the developing newborn brain. Excitingly, we found evidence of potential traumatic brain injury following exposure to ambulance-equivalent whole-body vibration. The ultimate goal is to re-design a transport incubator that better protect these transported infants. 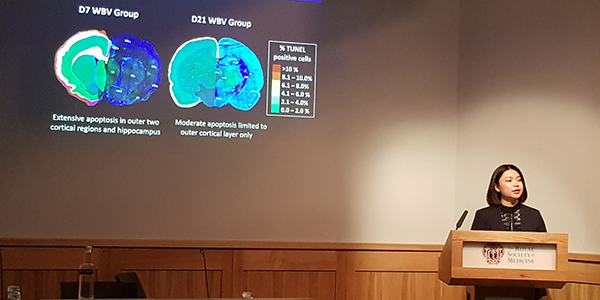 I had the privilege of presenting my findings at the prestigious Neonatal Society Spring Conference, held at the Royal Society of Medicine in London. It was surreal witnessing first-hand the stimulating studies and discussions between much esteemed experts; they offered me a sneak-peek of the future of neonatal care. Meanwhile, being the naive student, I felt immense responsibility of representing my team during my presentation. I suspect my epic enthusiasm and key messages resonated across the audience, which then granted me the prize for Best Oral Presentation! My burst of joy quickly subsided and morphed into a lingering realisation and respect. This was the epitome of academia: a community that proudly celebrates challenging work, yet humbly accredits even the most inexperienced. The research process taught me histopathological techniques, statistical analyses, critical evaluation of literature, and professionalism working within a team. More importantly, I was invited into a clinical narrative that strives to improve neurodevelopmental outcomes of preterm infants. By contributing new results and hypotheses, I helped construct better narrative clarity, whilst developing a modest sense of ownership towards the project. As future doctors, we hold responsibility towards our patients, and research is a pioneering way to shape and improve healthcare practice. My BMedSci experience has given me a taste of the reward, challenges, and clinical importance of research. Together, these propel me to seek further research opportunities, potentially sprouting a career in academic medicine. *The BMedSci degree is a key part of the undergraduate medical course at the University of Nottingham. It provides all our students with a strong scientific backgrounding for moving onto the clinical phases of the course. The programme also develops critical thinking to prepare students for the challenges of clinical work in their future medical career.